I first wrote this piece as a submission for a competition I took part in last year. I have since edited the product out of it as the product long term while good was not the right camera for me, I adore these posts and feel they should be part of my blog so all three in the series may make a reappearance. The beauty of the region where we live is hidden, understated and so easy to miss. Pop culture tells us that verdant rolling mountains, crisp peaks dusted with snow or crisp sandy beaches with turquoise waters are the places where nature and serenity reside. In focusing on what we should love, it's so easy to miss the unique zones of Australian landscape and the delight they hold. It's not a love for the cliche or the easy, its beauty is one forged in resilience and diversity, the true elements of our land. 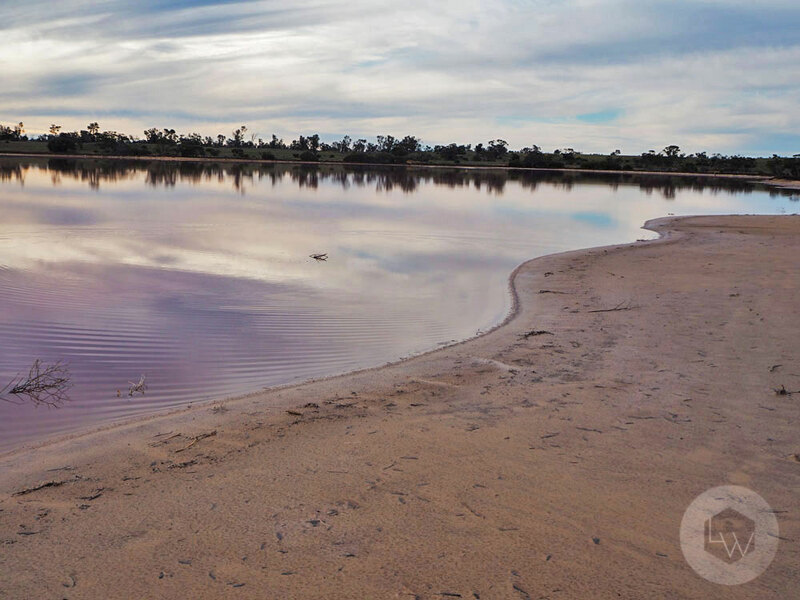 It had been so long since I had turned my mind to what is special about our region, beyond the lovely little bubble that is Mildura. On a whim we jumped in the car with some snacks, warm clothes and my camera slung around my neck to venture a little out of the way to capture our Delight at the Pink Lakes. Our trip to the Pink Lakes was a perfect reminder of the joy to be found in unassuming places, in less than ideal conditions. The lakes' beauty best shines on grey cloudy days, the kind of days that we normally choose hide away from nature and burrow deep down in our homes. 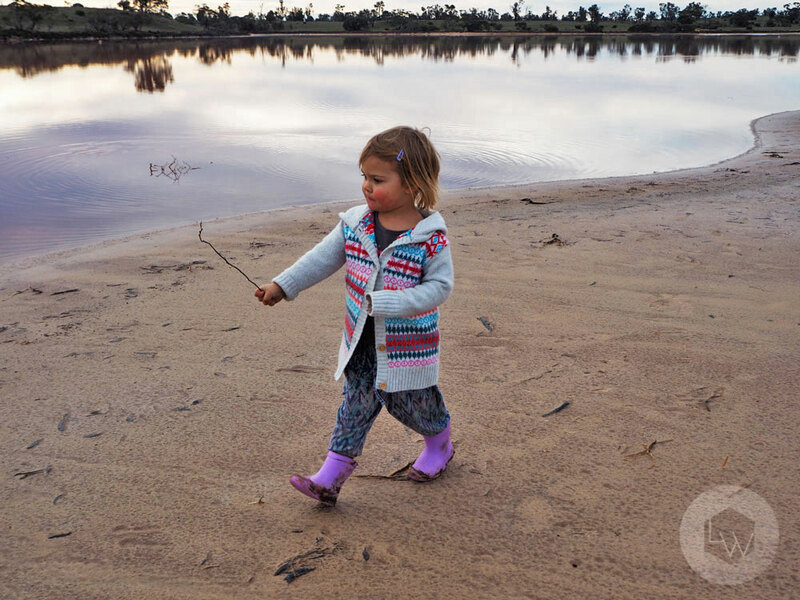 Yet one day spent rugged up, walking and viewing the wonders of this amazing place through our toddler's delighted eyes is all that was needed to see that there are always amazing things in this world to discover. 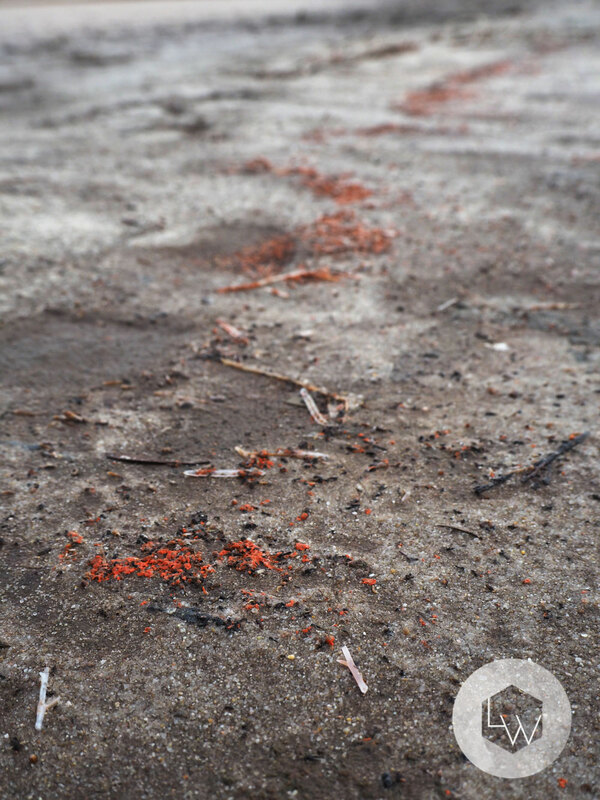 From the moment we arrived Eve was enthralled with the landscape, hunting and exploring even the smallest of details. In warmer weather the lakes teem with wildlife, and are a far more distinctive pink than we saw on this visit. Still there was something to be said about the tranquility brought on by the cold weather, the slower pace meant that was no urgency to the day, discoveries could be made at Eve's pace, our little family alone in the landscape. Taking the day at Eve's lead was a mixture of hurry up and slow down as she drank in the environment and delighted in its texture filled treasure trove of newness. From picking up the weathered sticks on the shoreline, to exploring the crunch of the salt laden soil underfoot and talking with her Daddy about why it looks a little like the beach but on digging deeper it isn't at all. As we moved closer to the shoreline, there were empty exoskeletons to examine, their ghostly paleness shone against the multicoloured layers of soil, a fascination for our learning little one. The quiet depth of winter represented perfectly by the salt encrusted bones of creatures now dead. 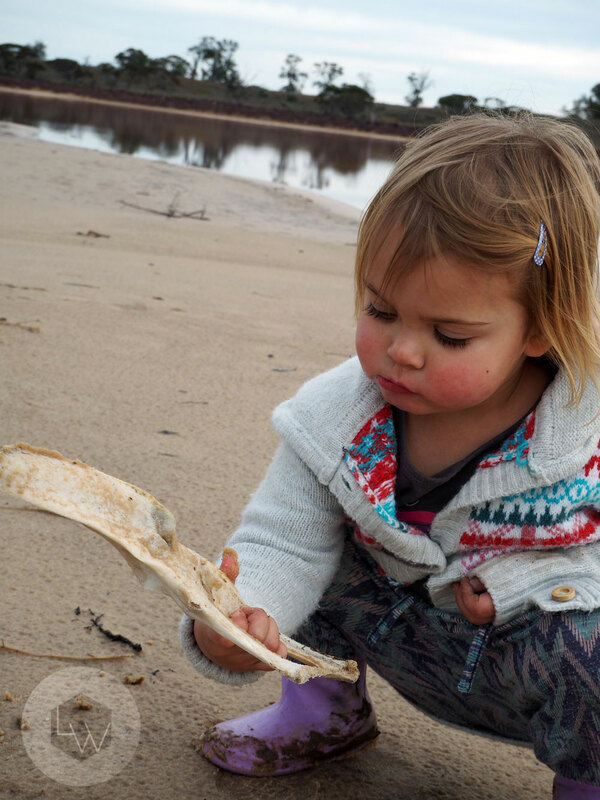 Eve’s sense of wonder not hampered by a fear of death, she handled bones and created stories of what they had once belonged to and why they were there. She then gently took them to the lake in an attempt to float them upon the crystalline surface, the pale glint of salt and bleached bone highlighting the magenta pockets of algae mingling with the salt which tint the lakes their unique hue, even when diluted by the winter wetness still apparent and stunning. Everywhere pockets of algae bloomed, a fiery ochre scattered through the lake and forming large swathes along the shores, unlike the pink of the summer when the water is low and it blends with the salt making for softer pink tones. It stained Tyler's fingers in a way that made me wonder if it was ever used to paint, in the time before the lakes were turned over with shovels and into wheelbarrows loaded onto laden down camels mining the salt. A time itself now all but an echo across the waters. As Eve sat her beauty reflected back in the beauty of the lakes, soft serene and quiet, our often bouncy girl seemed to absorb the atmosphere of the glassy surface. Gently prodding the salt water with a stick to see the ripples and the changes to her reflection, learning through interaction with our environment and seeing that by simply existing within it we effect change however temporary. More delights were to be found on the return half of the walk, the serenity and subtle changes of the lake shore meant a long walk did not weary us or our indefatigable toddler. The joy of squelching sticky mud, even when threatening a slip, or boots to be sucked away, was a pleasurable contrast to the earlier squeak and crunch of the salty shoreline. 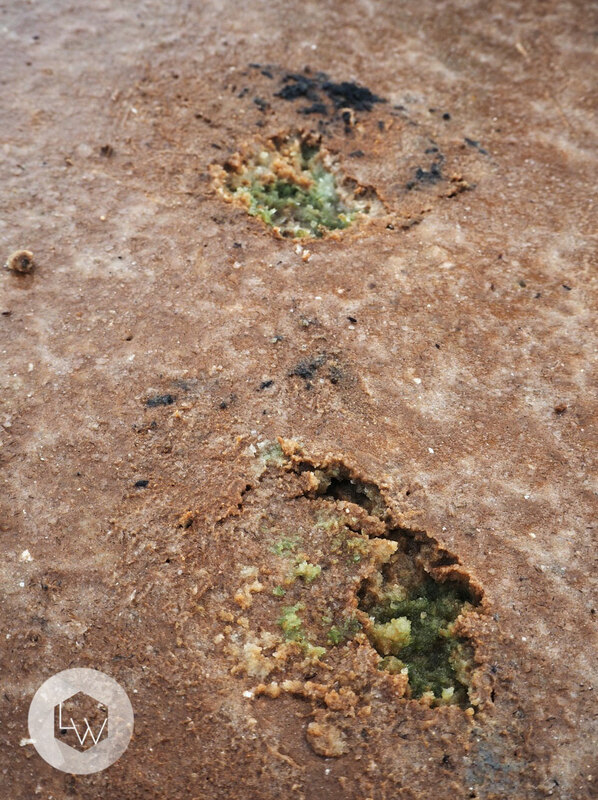 As each sticky foot was moved the remaining print yielded pattern in many coloured layers of salt crisp white, mingling with algae pink, soil black and algae luminescent green, coating boots and shoes an exchange of soil and motion. Nature reminding us that she leaves her mark on us as we do her, when we open up and pay attention. It had been six years since my last visit to the lakes and so much had changed, in nature and my life. While I drank in the beauty on my first visit so many things went unnoticed, things my eyes now saw through the joy reflected in Eve's. Her tiny hand tugging at mine, pulling me in to her great adventure, here and through all of her days. Her delight in these quiet winter discoveries reflected in the delight we take in each wild hair on her head and each long lash that graces her rosy cheeks. Because there was so much to take in at the lakes and I'm enjoying film making with the camera I've also made another Little Film for you.